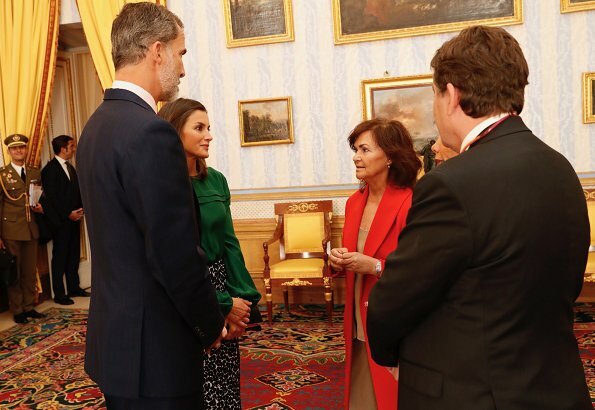 On October 08, 2018, King Felipe and Queen Letizia of Spain attended the annual meeting of the Board of Trustees of Cervantes Institute at Madrid Aranjuez Royal Palace. After the meeting, the King and the Queen gave a lunch for the Board of Trustees of Cervantes Institute and Ibero-American Ambassadors who are accredited in Spain. Cervantes Institute was established in 1991 and is a public body which aims to promote and teach Spanish language and spread Spanish and Latin American cultures. The Board of Trustees directs the activities of the Institute. Felipe is a gentleman a handsome..
Actually, his suits are well tailored, well fitting, and pressed, so yes, a good example of men's fashion. And, considering he's 6'6", clothing has to be more of a challenge for him. Beautiful blouse and skirt. She looks great. Like she always does! Cervantes would have appointed her his Dulcinea! Letizia looks wonderful. I love both pieces but not in that combination. I would have prefered another blouse / shirt with the skirt imo. To me it looks great together. Maybe the blouse in a different color would make it pop. Both pieces are nice but not together,this is OMO. This skirt makes her legs look super long. Beautiful outfit. Letizia's hair look so shiny, healthy and beautiful. Her hairdresser does great job! A skirt at the normal waist will make the legs look longer. The current low hip-hugging fashions make women look stubby with short legs AND give them a muffin top; I refuse to wear outfits like that. Bring fashion back to the natural waist and women will look feminine again. Agree with previous comments -- this is such a feminine and pretty look. I refuse to wear clothes that make me look stubby. I wear clothes that flatter me, yet are comfy to wear. The same with the hairstyles. I'm so glad that Letizia hasn't turned herself into rigid and serious-looking middle-aged woman. So what Letizia is a queen, why she can't still look pretty, young and feminine? Anon 8:38 I totally agree with you about Letizia. Her age should not mean she has to dress in a particular way. She is a beautiful woman and there is no reason that should not be celebrated. Love this whole look! The emerald green is great with the black printed skirt. Great. Preciosa blusa en un bello color verde. No la recuerdo, parece nueva. La falda sí ha sido usada anteriormente. 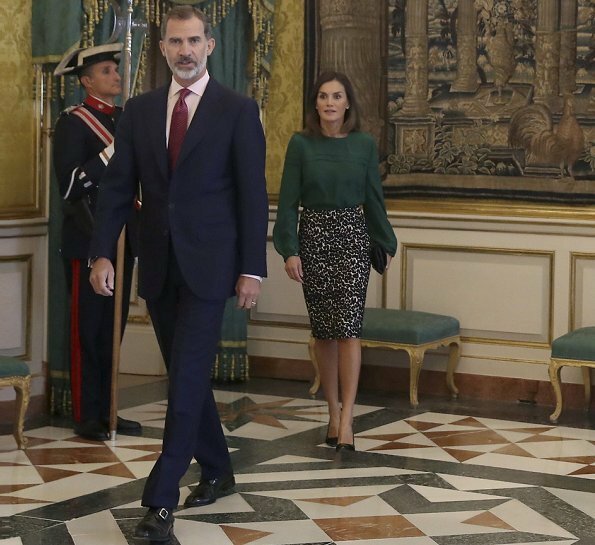 Un look bonito, sencillo y práctico de la Reina. Love the skirt, it's beautiful. La falda la sienta muy bien, el contraste de color con la blusa le da un toque moderno.